“From Where I Sit, Odinga’s Revolution Must Begin with Raila and His Four Children on the Front Line; Otherwise, Raila’s Revolutionary Rhetoric is simply Unrealistic and Childish! !” – Veteran Publishing Editor, Barrack Muluka. It is now close to two weeks since former prime minister Raila Odinga jetted back in the country after two months in the United states. His coming back saw him being accorded a warm welcome with leaders from the opposition. A huge rally was held at Uhuru Park grounds on that fateful day where the opposition took the government to task on some issues related to the governance of the country. CORD demanded for a national dialogue that will address alleged inequities in the country through an inclusive government. The coalition leader Raila Odinga while adressing the Uhuru Park rally said the dialogue will also address the rising cost of living in the country. The coalition went further to give the government 60 days within which to hold the dialogue. Raila gave July 7 as the deadline by which the talks should be held, failure to which, he said, CORD supporters would head to the streets to protest against the government. July 7, commonly known as Saba Saba, is a notable date in Kenya’s history. It is on this day in 1990 that the the then opposition leaders took to the streets to protest against the excesses of the Kanu regime and demand an end to one-party rule. Well, Cord has now released its program for countrywide meetings ahead of the Saba Saba rally to be held at the Kamukunji grounds in Nairobi on July 7.</p><p>According to The head of Cord Secretariat Norman Magaya these rallies would be used to consult the citizens on a number of national issues the coalition has been raising. The rallies will kick off from Migori town this coming Friday and CORD says this will just be curtain raisers to the Saba Saba event. Interestingly,the schedule has excluded central province but included Uasin Gishu County where the opposition had planned their rally on June 28. It should be noted that Uasin Gishu governor Jackson Mandago last week warned Cord leaders against holding rallies in the county cautioning that his government will not allow it. 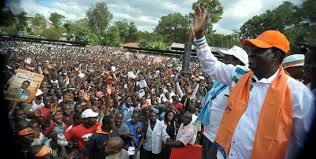 CORD however through its Secretariat says the law is clear no one can stop the, from holding rallies in this country. The coalition will be in Kisii on June 20, Kakamega June 21, Nakuru June 22, Garissa June 25, Eldoret June 28, Kisumu July 5 and Machakos on July 6. Will the police allow these ralies to go on? that is what still remains unclear.